All Web addresses mentioned were functional as of 7-31-15. From the Cumberland Gap to the Atlantic Ocean, this is Virginia Water Radio for the week of August 3, 2015. This week, we repeat a July 2012 episode, returning to group of insects whose species are known by many mysterious and even fearsome names. See if you can guess that insect group, as you listen for about 30 seconds to some of their names being called out by campers along the New River in Wythe County, Virginia. And here’s a hint: some of these creatures have club-like tails, but they don’t breathe fire. If you guessed dragonflies, you’re right! Clubtails, cruisers, darners, and other descriptive and sometimes scary names for dragonflies derive not only from these insects’ real appearance and behaviors, but also from historical superstitions or myths about supposed behaviors—such as the idea that darners could sew up the ears of misbehaving children. No matter what they’re called, all dragonflies, along with closely-related damselflies—collectively called odonates—spend the first part of their life cycle as aquatic forms inhabiting various still or slow-moving freshwater habitats, particularly wetlands, ponds, and the edges of streams and rivers. 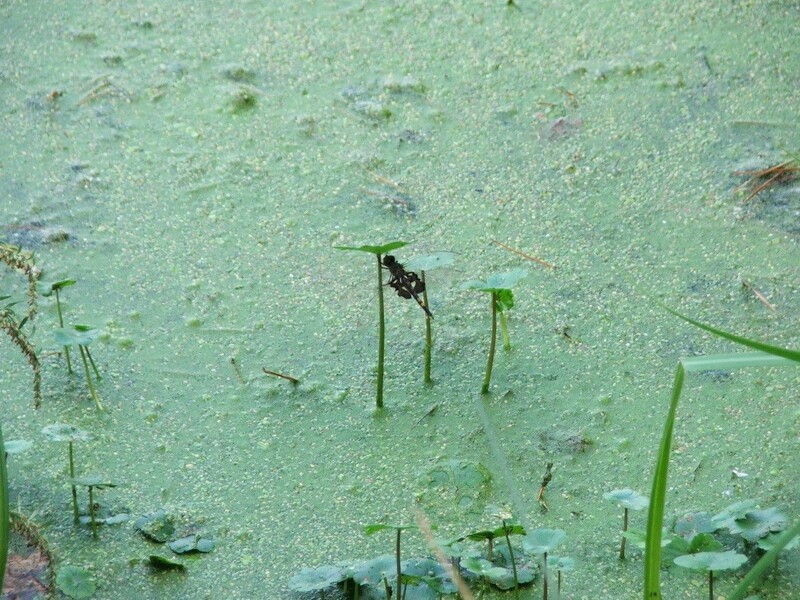 Both the aquatic immature forms and the flying adults eat large numbers of a variety of prey, including mosquitoes and other biting flies; and, in turn, they get eaten by certain fish, amphibians, birds, wasps, and spiders. With over 400 North American species, dragonflies and damselflies are as diverse, colorful, and fascinating as their names—and that’s no myth. This is an updated version of Episode 119 (7-16-12), which has been removed from the online archives. 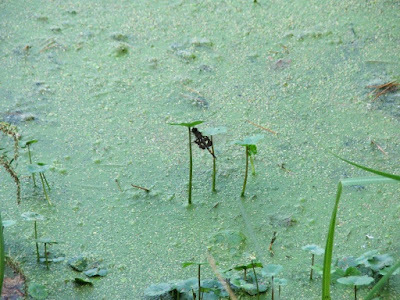 Thanks to several friends of Virginia Water Radio for recording dragonfly names on July 14, 2012. 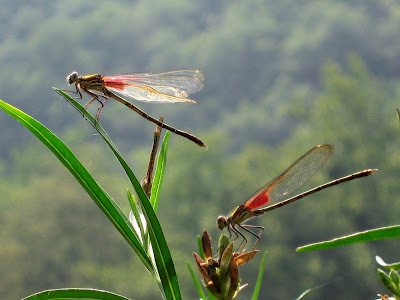 The dragonflies named in the audio were (in order spoken) American Emerald, Blue Corporal, Blue Dasher, Saffron-winged Meadowhawk, Yellow-legged Meadowhawk, Cyrano Darner, Eastern Amberwing, Eastern Pondhawk, Halloween Pennant, Lancet Clubtail, Unicorn Clubtail, Rusty Snaketail, Stream Cruiser, and Wandering Glider. Some bats and other dragonflies can also prey on dragonflies and damselflies; the audio failed to mention those to groups of predators. 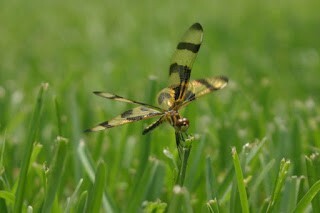 Halloween Pennant dragonfly, from the U.S. Fish and Wildlife Service's National Digital Library, online at http://digitalmedia.fws.gov. Black Saddlebags dragonfly on a pond at Eyre Hall, near Cheriton, Va. (Northampton County), October 6, 2007. Photo by Alan Raflo. American Rubyspot damselfly, in the New River at Foster Falls, Va. (Wythe County), July 15, 2012. Photo by Anne Jacobsen, used with permssion. Blair Nikula and Jackie Sones with Donald Stokes and Lillian Stokes, Stokes Beginner’s Guide to Dragonflies, Little, Brown and Company, Boston, 2002. J. Reese Voshell, A Guide to Common Freshwater Invertebrates of North America, McDonald and Woodward, Blacksburg, Va., 2002. W. Patrick McCafferty, Aquatic Entomology: The Fishermen's and Ecologists' Illustrated Guide to Insects and Their Relatives, Jones and Bartlett Publishers, Toronto, 1998; available online at http://books.google.com/books?id=wiTq7x-fI_0C&dq=aquatic+gnats&source=gbs_navlinks_s. 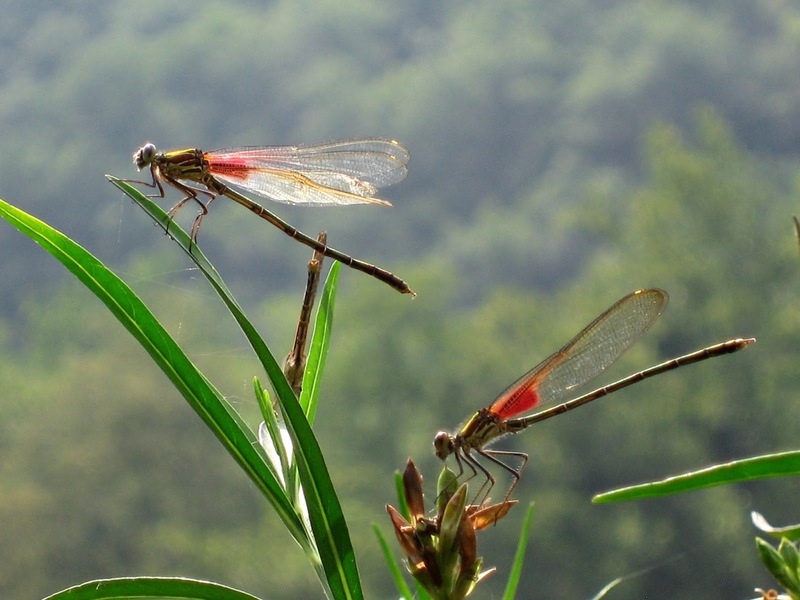 Prince William Conservation Alliance, “Northern Virginia Nature—Dragonflies,” online at http://www.pwconserve.org/wildlife/insects/dragonflies/index.htm. RELATED VIRGINIA WATER RADIO EPISODESFor previous episodes on Virginia insects and their water connections in Virginia, please see the “Insect” category at the Index link above (http://www.virginiawaterradio.org/p/index.html).